Norway's Foreign Minister tells MPs they were misled when they asked for assurances about funding to the PA.
Norway's Foreign Minister admits that his country's parliament was given incorrect information about the Norwegian financial support to Palestinian prisoners in Israeli jails. According to VG Nett, Foreign Minister Espen Barth Eide told parliamentarians that his predecessor, Jonas Gahr Støre, misled them in 2011 and 2012, when he assured them that Norway has control of where financial support to Palestinian Authority prisoners in Israeli jails ends up. "The direct support of Palestinian prisoners goes to cover canteen expenses," then-Minister Støre told the MPs. Minister Eide now admits that Parliament was led astray. "It is unfortunate that in retrospect, the information that was first communicated to the Parliament, which was in turn based on information obtained from the PA at the time, was imprecise." 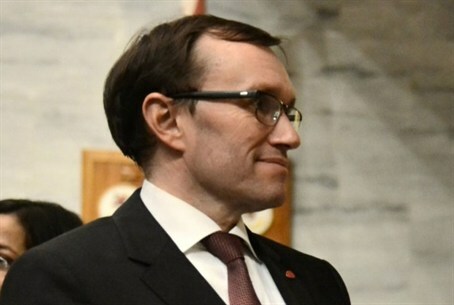 Eide writes that the Norwegian authorities relied on information from the Palestinian Authority (PA), but that now they have been "made aware of the new information on this issue that differs from earlier information provided by the PA."
The Foreign Ministry will now investigate the question of where the money really goes, according to the report. Norway supports the Palestinian Authority with several hundred million Kroner annually. Besides leading Norway donor group that coordinates financial support from a number of countries. Opposition MPs found the reply lacking. Hans Olav Syversen (KrF) said, "The answers to Parliament have been based on half-answers and excuses. This is a serious matter. We have clear indications that people convicted of terrorism were actually rewarded with funding from Norway. How can there be peace and reconciliation if they are in fact reward the opposite?"